Upon World War I's conclusion, the Goodyear Tire and Rubber Company continued to manufacture zeppelins. The firm used most of these ships to advertise its products. By the late 1920s and the early 1930s, among the firm's completed zeppelins were the Pony, Pilgrim, Puritan, Volunteer, Mayflower, Vigilant, Defender, Reliance, Resolute, Enterprise, Ranger, and Columbia. Most of these ships utilized helium to become airborne, while zeppelins originally used heated air or hydrogen. During this period, other companies, especially European ones, were constructing airships to transport passengers, including across the Atlantic Ocean. 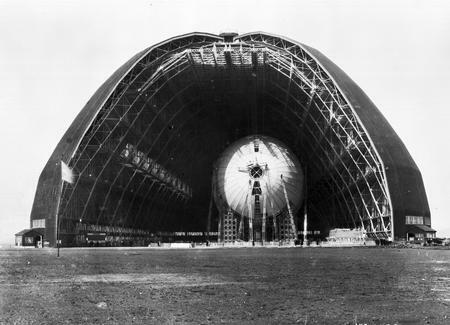 Goodyear also manufactured two airships, the Akron and the Macon, for the United States military during the early 1930s.During World War II, the company manufactured 104 airships for the military at its Akron facility. , in the United States. Do you have comments that you would like to send us about this entry? Use our secure feedback form to send us your thoughts.